For weeks now, agak mencari-cari juga macamana nak ajar Haris membaca? To read in English and Malay pula macamana? 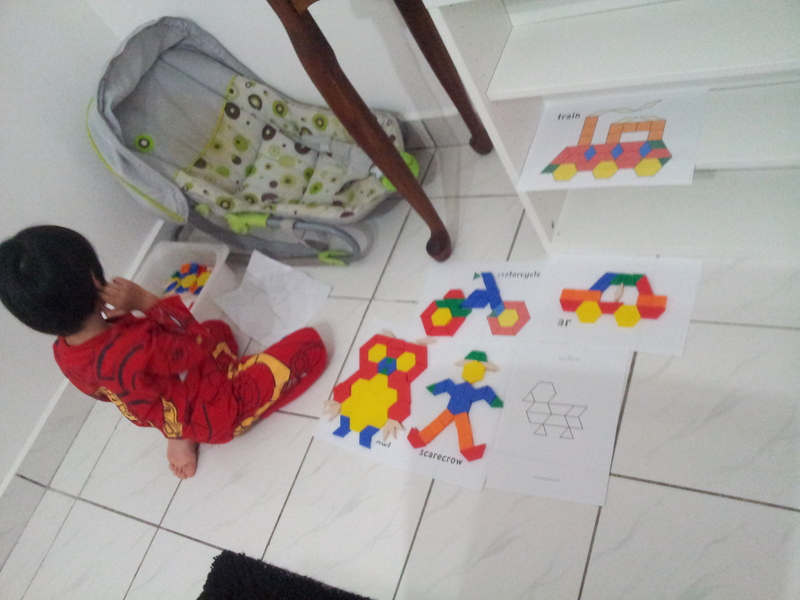 He already knows alphabets, and knows each sound. Since I already decided to use 100 Easy Lessons, let’s just go with it, I thought. Tapi Haris macam tak berminat. Kejap-kejap sangat dia concentrate. Buku-buku pulak, pun kejap juga pandang. Tapi bila cuba juga baca depan dia banyak kali, last-last dia tengok juga and he only looks at the picture and only interested in what’s happening in the pictures than read pastu buat cerita dia sendiri. Takpe. Pelan-pelan. Insha Allah, moga dia minat dengan buku-buku nanti. So, I came across Progressive Phonics. A free reading programme. Since he already knows alphabets, I skipped that and printed Beginner Phonics Book 1: Short Vowel a. To make it interesting for him, this is how we did it. First I identified the words used. -at family. at, bat, cat, fat, hat, mat, rat, sat. I wrote those words on paper and paste it on our sliding door. I then printed pictures for each word. We also use Starfall for reading practice. He’s been doing his IQRA’ with Papa, tapi dia menghafal dan tidak mengenal huruf. Sure, he can recite until ‘Ya’. Tapi bila randomly asked yang mana, yang mana dia tak dapat jawab. I’ve been thinking cemana nak buat. Lightbulb! I got an idea! Use BINGO! Lol. I’m so going to use Bingo for everything now because he enjoys it. So we covered Alif til zal. Bubble time together with Hana.